Why did you decide to go into business together? When this opportunity came along, we saw this as a great way to network and spend more time together, while selling a product that we truly believe in that is local and homemade and makes everyone happy! What strengths in the marketplace does your partner have that you lack? Ashton: Steve is the scooper! My arms weren’t built for scooping ice cream, haha! Steve: Ashton does a great job at keeping me working by booking gigs and keeping us organized. How do you keep work from ruining extracurricular/fun events? We bring the truck to all of the events we normally attend. It’s fun to interact with the community and our friends while providing a great product. What advice would you have for someone considering going into business with a spouse or a family member? Were there any books or local resources that guided you during start-up? 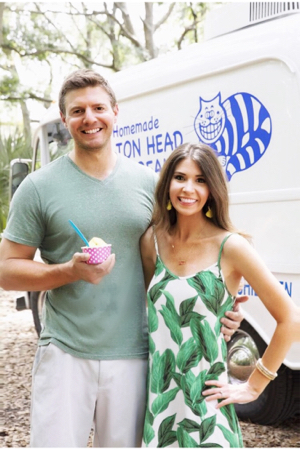 The owners and management of Hilton Head Ice Cream encouraged and supported us throughout this entire endeavor. We could not have been successful without them! 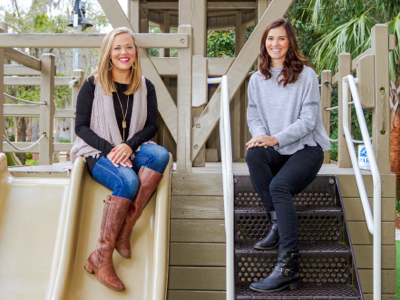 Four years ago, we began work together when we opened Hilton Head’s newest eyewear boutique, Spex. We quickly learned that, as a team, we had a great synergy and understanding of what our clients expect and how to deliver top notch service to them. When MyEyeDr decided to leave the market, we jumped on the chance to return to our passion by opening Eyeland Optique. Billy: As a long-term resident of Hilton Head, Jeanine understands all things that people on the island love and enjoy—especially golf. 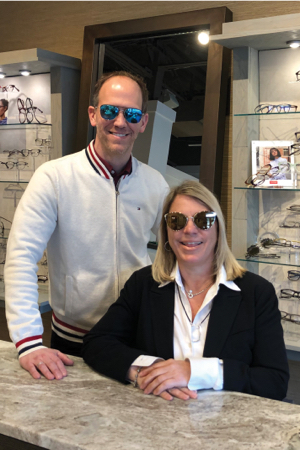 Jeanine’s background in prescription lens and the lab process gives our team a unique opportunity to deliver state-of-the-art technology and the ability to deliver expert optics that clients love to wear. Jeanine: Billy really excels at exceeding a client’s expectations and has a real passion for working one-on-one with each of his patients to determine all their needs. If a client is looking for something very specific, Billy’s knowledge and expertise in the industry gives him the ability to find the exact fit every time. Plus – he is a master at understanding insurance plans. How did you meet your business partner? The eyecare industry is a small world. We met working in different parts of the industry in the Chicago area. Billy grew up in the world of optics in his family’s optical practice in Georgia but moved to Chicago when he graduated college. There he became manager of an optical boutique that was a client of Jeanine’s prescription lab business. What advice would you have for entrepreneurs considering entering a business partnership? You need to make sure your values and passion for the business are a good match. If you share these two things, everything else falls into place. Like any partnership, work hard to respect each partner’s strengths, and let them shine. If the common goal is to provide the best possible service to your clients, you will be very successful. Larry Setola Sr. & Larry Setola Jr.
What makes these two men a dynamic duo is the Yin and Yang effect shared in their family business. Larry Setola Sr. has been working in the trade since 1974. But Larry Jr. provides a fresh new perspective on what the company can offer and how to further their growth while incorporating their specialties. What one lacks, the other provides. For instance, Larry Sr. had no experience with marketing beyond the reliance on “word of mouth.” Larry Jr. noticed this and was able to take an outsider-looking-in approach to provide the company with a long-term marketing strategy and a website, which includes many pictures of their finished projects. As a three-generation family business, they continue to do just that. In 1994 they operated out of an extremely small workshop, and at that time, Just Cushions only specialized in cushions and slipcovers. 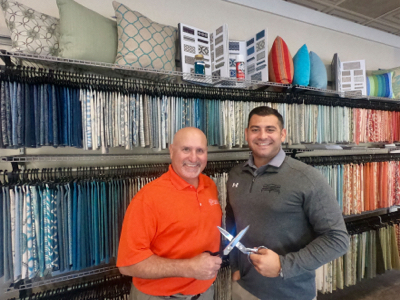 Now, in their newly renovated 6,500-sq.-ft. showroom and workroom, they also offer custom re-upholstery, window treatments, bedding, rugs, custom built furniture and more! We recognized a need in our Lowcountry community and felt that, with our individual strengths, we could better meet the need by sharing resources and working together. AC: Leslie has vision that I lack; she is able to see big picture, months and years down the road. She keeps her focus on these things, and it helps me not to get caught up in the little stuff! LB: Ashley has a much more outgoing personality than I do. She cares so much about the kids and is an awesome therapist, while I enjoy working behind the scenes. Our work truly is fun! We are working to enrich children’s and families’ lives each day. That interaction exposes us to a number of fun events that we otherwise might miss out on. AC: A good partnership should be grounded in the business and operate on mutual respect for one another. LB: Know your strengths and weaknesses and appreciate what the other person brings to the table. There is a lot of give and take in a good partnership. Our relationships with area pediatricians, industry professionals, and early interventionists continues to help us maximize our outreach in the community. Our partnership began in 1992 when we married and joined forces to continue raising our four daughters. After completing successful 35+-year careers in Cincinnati, we embarked on a new life in retirement. Our careers had been demanding and focused on lofty goals and results for our employers. A lifetime of identifying problems and creating solutions would pay off as the idea of opening a business was born. Though we were partners in life, we never foresaw a scenario where we would work together as business partners. That opportunity gradually arose as retirement evolved into semi-retirement. During this phase, we were learning the basics of jewelry design and construction. In 2012, the desire to grow to the next level was the genesis for opening The Silver Garden. Now in our seventh year, we have a fun, growing post-retirement career. Though most of our friends are winding down their careers, last year we expanded our business to include a full art gallery, featuring the works of over 40 local artists in all mediums. It was a “let’s just do it” decision that has been energizing and fun. Retirement will have to wait a little longer. We feel blessed and thankful for this second career and that we still possess the energy and desire to pursue our dreams. 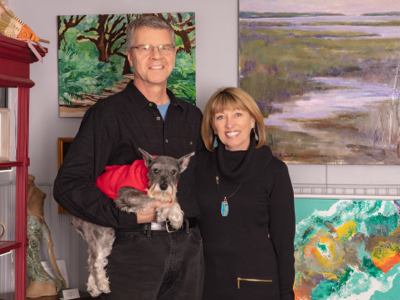 Bob and Rochelle Clarkson fell in love with the Lowcountry while they were dating, back in 2003. Shortly thereafter, they married and relocated from Orlando, Florida to Hilton Head Island to start a new life together in a slower paced environment. But the slower pace didn’t last long. Too young to retire and too passionate about their careers, they drew from past experiences and launched new businesses that have both become local success stories. Bob founded The Alliance Group Realty in 2010, which has become one of the leading real estate brokerages in the Lowcountry with over 70 sales associates and offices on Hilton Head Island and in Bluffton. In 2016, Rochelle opened Alliance Dance Academy in Bluffton, which currently has over 250 students and recently relocated to a larger facility. 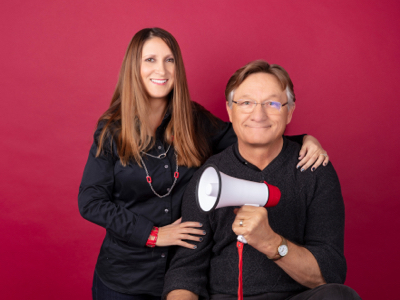 Although they are in completely different businesses, the couple’s philosophies are exactly the same: They believe business is all about the people, and if you take care of your people, everything else will take care of itself. “My teachers are my family and the kids are like my own,” Rochelle said. The Clarksons spend most weekends on their sailboat named Turning Pointe. 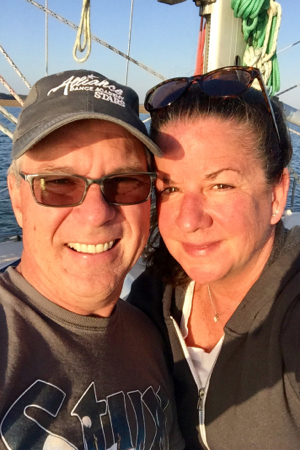 “We both work very intensely, and our sailboat is our sanctuary,” Rochelle said. The Clarksons acknowledge that couples working together can be challenging, so they keep it separate. Bob doesn’t dance and Rochelle doesn’t watch mortgage rates. That leaves their free time for the things they love to do together, along with their two dogs. It is the perfect Alliance! Why did you go into business together? Dr. Reid: I was impressed by Mandy’s reputation and expertise as a licensed medical aesthetician. 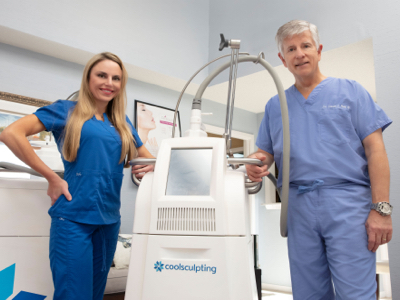 Mandy Fulmer: I was drawn to Dr. Reid’s years of experience, reputation, and his desire to provide the latest technology in our industry, such as CoolSculpting®, which is an FDA-cleared, non-surgical fat reduction treatment. And it’s permanent! How did you decide to offer CoolSculpting? Dr. Reid: I thoroughly investigate and evaluate new technology before offering it to my patients. CoolSculpting had been proven extremely effective in freezing and removing fat cells from the abdomen, arms, thighs and chin with lasting results. The procedure has been performed millions of times worldwide, and it’s safe, requiring no surgery or anesthesia. How do you work together in providing this service? Mandy: Dr. Reid has the medical perspective. During a consultation, he can determine whether a patient is a good candidate for CoolSculpting and set expectations for results. Dr. Reid: Both Mandy and I have in-depth training and certification specifically for this treatment having attended Cool University certification in Virginia. How do you keep work from ruining hobbies or fun events? Mandy: We keep a good work/life balance. I especially enjoy the gym and travelling. Dr. Reid plays trombone in the Hilton Head Plantation Big Band and enjoys playing golf. Dr. Reid: And we do incorporate some fun into our work. We offer CoolEvents, for instance, for people interested in learning about CoolSculpting. They’re casual meetings, usually in the evening, with cocktails and hors d’oeuvres, too. I would say that Dave is more of a numbers guy. I tend to be more of the creative one and interact personally with the clients. What is the worst part about working together every day? I can’t say there is a “worst” part; I appreciate the fact he is here, and we can bounce ideas and business decisions around 24/7. How do you keep work from ruining family functions/fun events? Family functions and fun events revolve primarily around our three children and three grandchildren, which always are our number one priority. We’re lucky to have them all in this area, so we spend a lot of time with them. They’ve been raised in an entrepreneurial family, so at times we can all discuss business together. Dave is semi-retired; we’re used to being busy, so why not help out? Be prepared that you may not always see eye to eye. There has to be a “lead dog!” We do need down time at home where the business is not discussed. 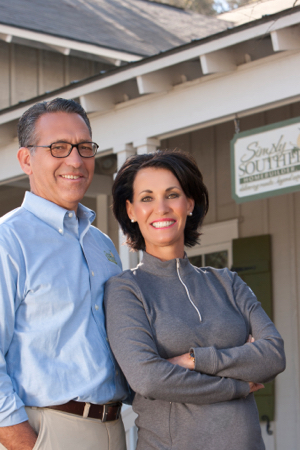 What is your favorite family-owned business on HHI or in Bluffton? There are several. The first one that comes to mind is Hogshead. John and Alexis put their hearts and soul into their restaurant, and it shows! Personally, I don’t know how they manage the hours that being in the restaurant business requires. But it’s always nice to see them when we go in. Special touch. We just did. I was already working in the hearing aid business, and Caryn really liked the idea of helping people. We decided to do our first clinic, and it just worked; we worked well together. Randy: Caryn has organization skills that are unmatched. She has the ability to do the books, payroll, advertising. She just keeps us sane. Caryn: Randy has the ability to communicate with anyone. His passion drives our success. Randy believes everything works out. I am a little more pessimistic. I admire that about him and try to see it his way. We leave work at work. Early on it was hard to separate the two, but as we always do, we just sat and decided not to discuss business on our free time. It does pop up from time to time, but we manage to keep it separate. We met at Montgomery Ward (now there’s a throwback). Randy was managing Miracle-Ear, and Caryn was managing a hair salon, all inside Wards. Randy: I really have no pet peeves with Caryn. I do, however, hate it when people litter or leave their shopping carts in parking spaces. What advice would you have for entrepreneurs considering a business partnership? Randy: Be honest; know your partner’s strengths and weakness, and build on both. Caryn: Communication is key, as with any relationship. Never hide anything from your partner. Talk through everything. Randy: Experience. I had a great mentor; I read everything I can find. Our goal is to serve our patients and give the best service we can. Caryn: Not for this location. When we first started years ago, we purchased a book on how to write a business and marketing plan. Very important. Keeps you on track.